Let’s talk plastic. It’s a problem all over the world, we all know this. In Cambodia you see the evidence of it scattered over the road, in the clogged up rivers and at all the shop vendors who are only too happy to give you everything packed in plastic and more plastic. But it’s July again — and that means we’re in the middle of Plastic Free July. Well, it’s taken me longer than I expected to write this, so we’re more like 3/4 of the way through, but who’s counting? The Joker and I have jumped on board, trying to reduce the amount of plastic we use and taking some time to encourage others to make alternative choices. I admit we don’t have a perfect track record but we’re making progress. 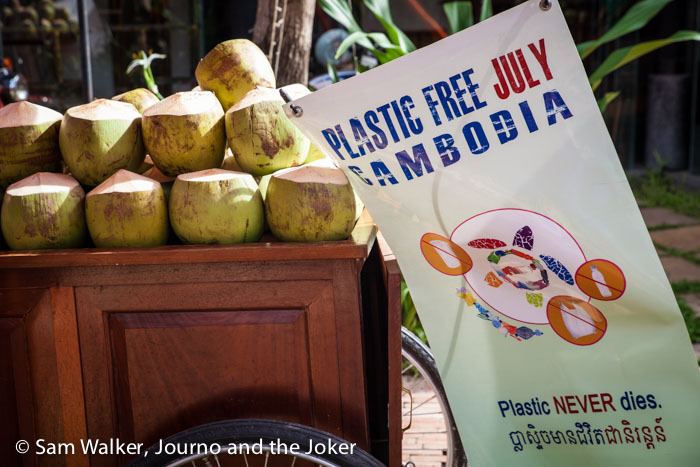 The Joker flew into Cambodia on July 1, just in time for the official launch of Plastic Free July Cambodia. This initiative is run by our friend Sarah Rhodes and her team of enthusiastic volunteers, who are all looking to inspire change. Kings Road kindly donated a heap of coconuts for the occasion, which were enthusiastically enjoyed through bamboo straws (and a few with the addition of a shot of vodka or Malibu – yum!). I was thrilled when someone gave me this gorgeous bamboo cup she made. 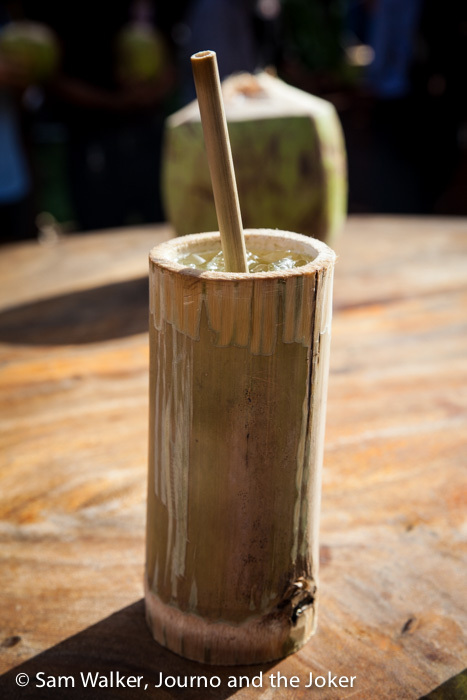 It’s filled with sugar cane juice and the bamboo straw is perfect to drink it with. It takes 500 to 1000 years for plastic to break down. But the particles never go away. They become tiny grains in the earth and oceans. So the more of it we create, the more there is, with nowhere to go. It’s estimated about half the plastic we use is single-use plastic. That is, we use it once then throw it away. The big culprits here are plastic straws, plastic bags, plastic cups and plastic water bottles. Styrofoam takeaway containers are also on the list. These five are the biggest focus of the Plastic Free July Cambodia campaign. Plastic bags — It’s believed the average Cambodian uses more than 2000 plastic bags a year. That’s a lot more than many other countries. We have a shopping bag we take with us. The shop vendors are sometimes confused but even at the local market they are getting used to me saying no to plastic bags. Straws — Have you ever thought about what a waste straws are? We use them once, for one drink, then we throw them in the bin. One bar or restaurant can go through thousands or tens of thousands a month. Some places delight in giving you two straws in one drink. This has been a tough one to break here. I”m getting better at remembering to ask for no straw with my drink. But sometimes I’m ignored or misunderstood. Sometimes a straw arrives in a drink I wouldn’t expect it to and sometimes a glass of water is presented without me requesting it — you guessed it, complete with straw. Places I go to regularly are used to me asking for no straw, but sadly they don’t carry this on to all the other guests. For those of you who request straws, I recommend you reconsider. Plastic cups — plastic cups are common place in Cambodia. Buy a coffee, a sugar cane juice, or a number of other drinks and it is put in a plastic cup, with a plastic straw and placed in one or two plastic bags, just for good measure. This is going to be a tough one to break, as it is usually the small street vendors that sell this way and plastic alternatives hit their bottom line hard. Still, for those of us who say no, or take re-usable cups, it makes a difference. Water bottles — another tough one in a country where the water often isn’t safe to drink. Bottled water has become the go-to for locals and tourists alike. We have got around this by buying a water filter — a terracotta filter that drips into a big drum, admittedly it is a plastic drum but it is long-lasting and not single use. I don’t know why more people in town don’t use these filters. They are supposed to filter out 99% of bacteria. 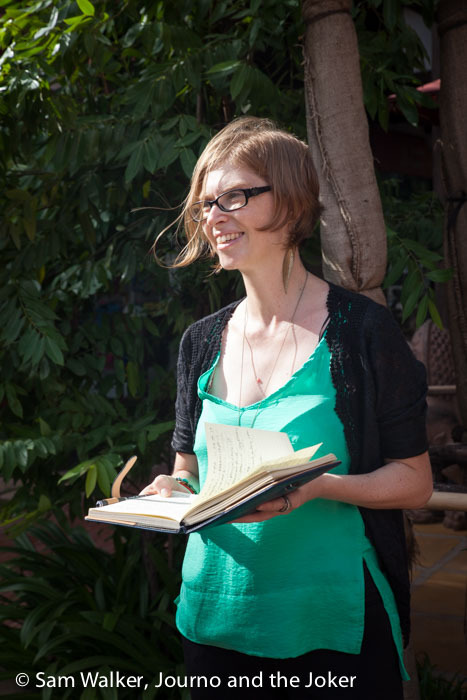 We’ve used one most of the time we have been in Cambodia. Styrofoam packaging — Unfortunately this is used widely in most take-aways and at many street vendors. When I remember, I take a container with me. Some places are using eco packaging made from sugar cane pulp but the vast majority are not. It is small steps but we are making changes and hoping others will follow suit. It is a slow process and education is the key. That, and breaking habits. Are you doing anything to reduce your use of plastic? Do you still need a straw with your drink? Let us know if you are making changes. As long as it’s an improvement that’s a step forward. I talked to 25 English language students about Plastic Free July yesterday. They were interested to learn but I’m not sure they have got the full extent of the problem and how they can avoid it. Baby steps. Well done for raising the flag about the abuse of plastic. Whether it’s Cambodia or Australia, developed or undeveloped countries, raising awareness is crucial in fighting the overuse of plastic. I still can’t believe that supermarkets in WA readily hand out plastic bags as if they’re going out of fashion. Having said that, I tried to do the challenge on only started realizing now, how much plastic I could be avoiding with a bit more effort. Thanks for the comments Nina and congrats on trying the challenge. Yes, when you start it, you realise just how much plastic is in our lives and much of it we really don’t need. I had thought straws were a particular problem here in Cambodia. Hadn’t really noticed the issue in Australia until I was back there a few months ago. Every drink came with a straw, even a glass of water. I never gave much thought to straws either until recently. The other thing that really gets me is balloons. Sometimes I wonder where people think they go when they send them up into the sky. Oh God, yes Nina! Balloons drive me crazy too. And they are often released for supposedly good causes. Where do people think they go after they sail upwards and onwards with the breeze.